Lighten your plate after the holidays with a seasonal salad of winter greens and nuts tossed with a zesty Pear and Apple Cider Vinaigrette. 1. Apple Cider Vinaigrette: In a very large bowl, with wire whisk or fork, mix brown sugar, vinegar, mustard, salt and pepper. Gradually whisk in olive oil until blended. 2. Winter Green Salad With vegetable peeler, shave 1 cup loosely packed shavings from wedge of Parmesan cheese; set aside. Add radicchio, endive, spinach and pears to large bowl; toss. Drizzle with dressing. 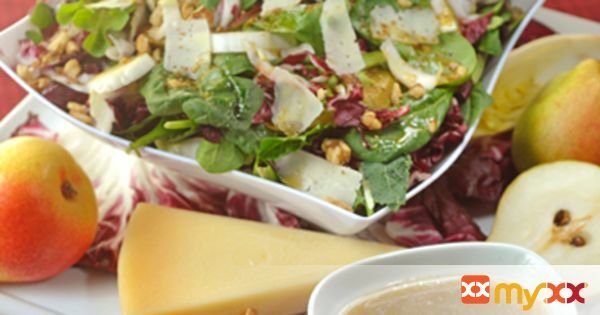 Serve salad topped with Parmesan shavings and walnuts.